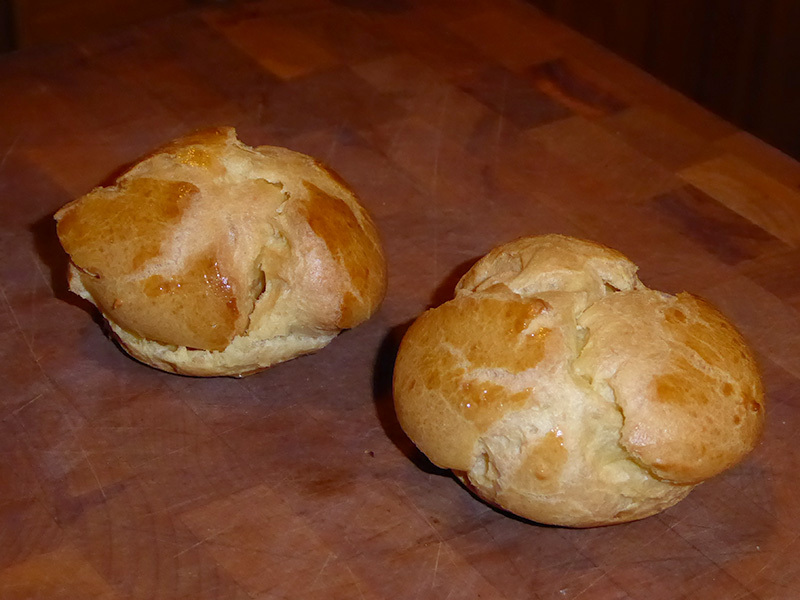 Before doing the main batch, I did a couple of test profiteroles to ensure that using a #40 disher instead of a piping bag wouldn’t cause problems. They look pretty good to me – nice and crisp, too, after being slashed on the side and left in the turned-off oven for five minutes to dry the inside. These are big enough that after I pipe the banana custard in, I can then slip the strawberry slice in through the side slash as a sort of surprise, with just chocolate ganache on top. (They are better with a good quality strawberry slice than without.) I made the ganache with bittersweet chocolate, double cream, butter, vanilla, and a tablespoon of rum.